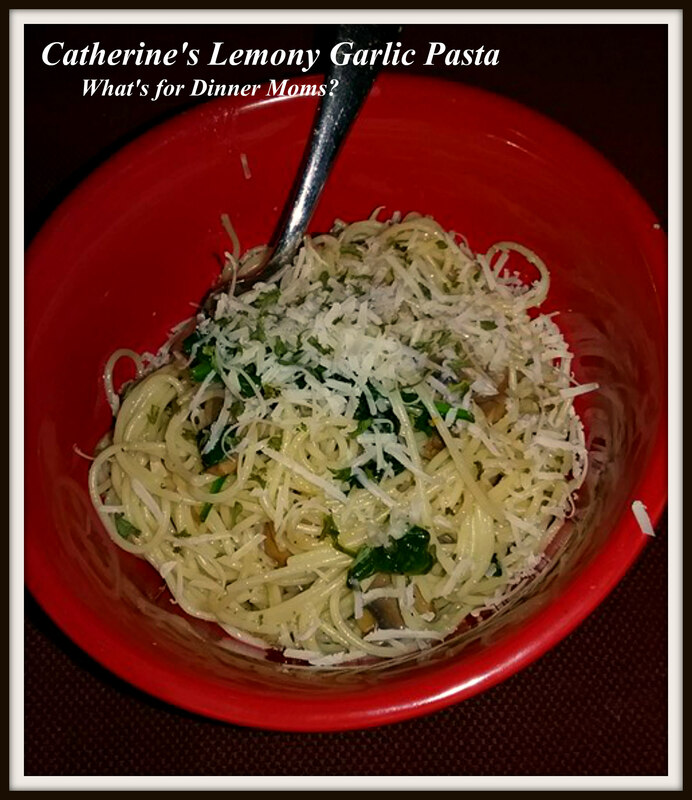 Catherine’s Lemony Garlic Pasta – What's for Dinner Moms? I have to share this with you because I am such a proud Mom. We went out the other night for a rare date night and left the kids home to do homework. I did not make dinner as we were super busy but I knew there were some chicken tenders in the freezer, along with a frozen pizza, and some chicken soup. I wasn’t worried about them. When we got home my daughter was so excited to share the pictures she took of their dinner and explain to me how she made it for them using things we had on hand in the refrigerator and pantry. It worked! My plan to teach them to cook has worked! My daughter does not like the smell or touch or raw meat so she made a vegetarian dish for her and her brother that they both really enjoyed. She learned that you have to add more spinach than you think you do because it shrinks up so much and that real lemons are far superior to lemon juice. This was a great first attempt for her in creating dinner. She added real lemon juice for acidity, a bit of Parmesan cheese for depth, and garlic for flavor. She was so pleased with herself. Tip: This is her recipe. She cooked it by taste and so will you. If you notice in ALL of my recipes somewhere in the directions I tell you to taste and adjust spices to your liking. We are all different. We like different flavors, heats, and spices. Taste it and make it what your family will love. This is the perfect recipe that lets you do it to your taste. Just before the pasta is done boiling place olive oil in a large skillet over medium heat. Add garlic to pan and saute for 1-2 minutes until well fragrant. Add baby spinach and mushrooms to pan stirring constantly until spinach has wilted. Add black pepper and salt as desired. Once pasta is cooked and drained add it to the skillet and toss with the spinach and garlic. Squeeze lemon juice over the top and toss. Sprinkle top with Parmesan cheese and coarse black pepper. Taste and adjust spices. Use powdered garlic if needed. Serve hot with lemon wedges and extra Parmesan, if desired. Sounds easy and delicious. Good on your daughter. How wonderful when they start creating. Thank you! I just never really thought she would do it! Thank you. She was so very proud of herself. Wow, not only does it look and sound delicious, but it may be time for another date night. Good job with your daughter – mom. Thank you so much! I am proud of her for taking the initiative and just doing it! This is so wonderful! My son is 11 months old so it will be quite a while before he can cook his own dinner – but this gives me hope for my future! Not to mention, this pasta dish seems easy and quick to make – adding to my weekly meal planning menu ! Thank you! She cooks for herself and her brother when we are not home but it is eggs, canned soup, etc . This is the first time she experimented on her own. So inspiring! I will make this with my daughter over Spring Break and let her know that another daughter from my Blogger friend inspired it! Congratulations, Marci. Catherine is going to take after you with her imaginative cooking. Thank you! It made me happy that she at least tried it. This recipe sounds delish. Check it out! I will have to try this one for sure!